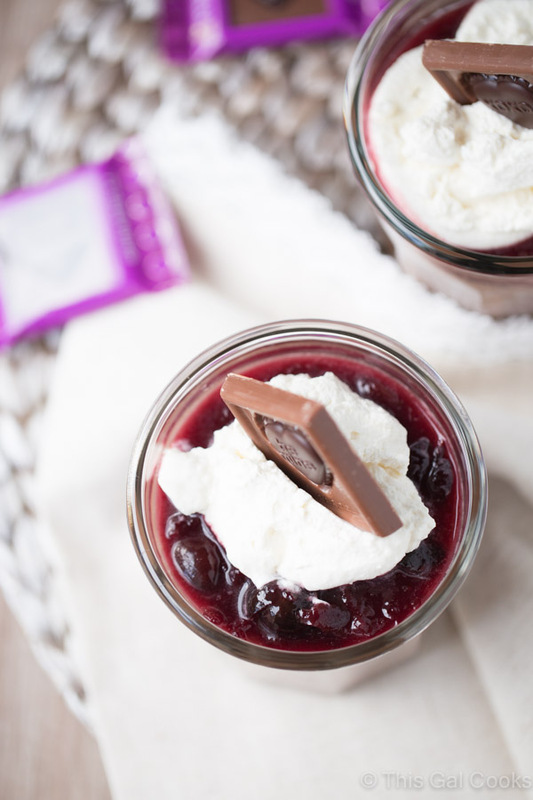 Smooth and creamy homemade chocolate pudding cups are topped with homemade cherry sauce and homemade whipped cream. Delicious and simple to make. On Sunday I did something I’ve never done before…I made homemade chocolate pudding. It was delicious and super simple to make. I used my favorite baking chips – Ghirardelli Bittersweet 60% Cacao, to make the pudding. BEST idea ever. 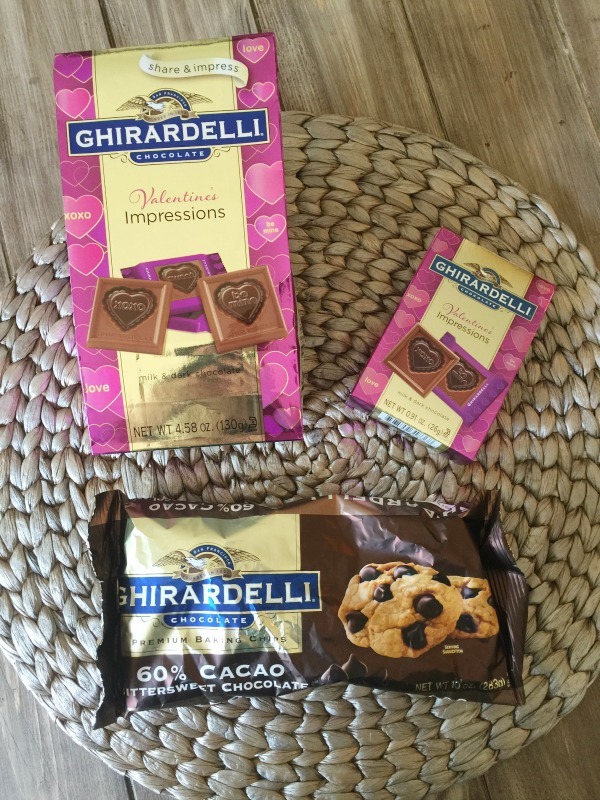 I love Ghirardelli because they produce top quality, great tasting chocolate products. Using the Ghirardelli 60% cacao premium chocolate baking chips, as I did, will ensure the best taste and texture to any baked treat or decadent confection. Let me tell you, this homemade chocolate pudding has a smooth creamy texture that will make your mouth explode with enjoyment! And it’s all thanks to Ghirardelli chocolate and my knack for making things with love. Valentine’s Day is right around the corner. If you’re like me, your favorite thing about Valentine’s Day is the sweet treats. Cupcakes, chocolates and fruit, I’ll take one of each. When I decided to make these homemade chocolate pudding cups, I knew I wanted to add some fruit to the mix. I absolutely LOVE cherries and since cherries pair well with chocolate (hello chocolate covered cherries and black forest cake) I decided to make a homemade cherry sauce to go along with the homemade chocolate pudding. I also made some homemade whipped cream to go with this amazing dessert. Everything about this recipe is homemade. You can tell your Valentine that you spent hours making this delicious homemade dessert for them. They don’t have to know it only takes about 30 minutes to prepare! 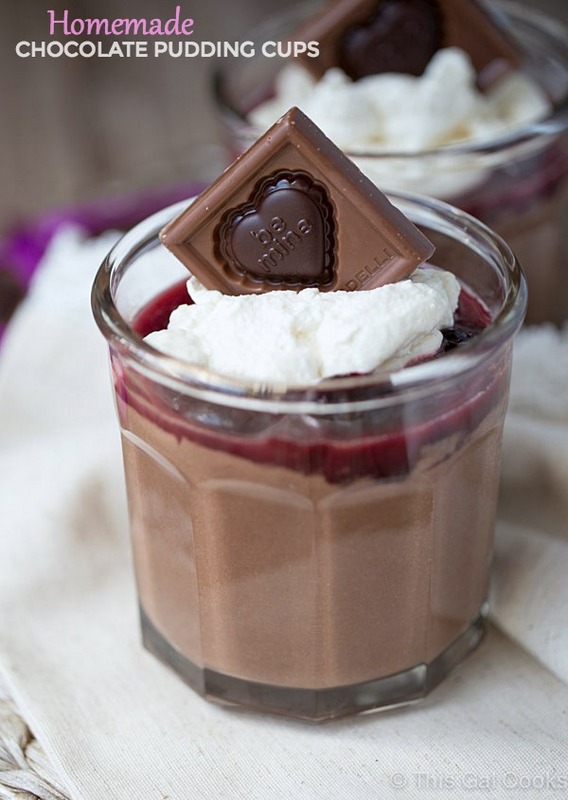 I topped each homemade pudding cup with a Ghirardelli Valentine’s Impressions Chocolate square. You can get the squares in two flavors, Milk & White Chocolate and Milk & Dark Chocolate. I opted for the latter because dark chocolate is my ultimate guilty pleasure when it comes to chocolate. You know what I love about these little chocolate squares, besides the fact that they are CHOCOLATE? They leverage the format of candy conversation hearts! How cool is that? Let the chocolate do the talking for you. Make the cherry pie filling. In a sauce pan, heat the cherries over medium heat until the cherries release a good amount of their juice, about 10 minutes. Once the cherries are done cooking, remove from heat and sprinkle with the ½ C sugar and the 2 tbsp cornstarch. Stir in the almond extract. Cover and set aside. Make the pudding. In a heavy non-reactive sauce pan, heat the milk and bittersweet chocolate over low heat, whisking until the chocolate is melted. In a mixing bowl, whisk together the ¾ C sugar and the egg yolks until the mixture is pale yellow. Add the cornstarch, salt and vanilla extract and whisk until smooth and well incorporated. Pour the egg mixture into the chocolate mixture and mix well. Increase the heat to medium heat and cook for 6-8 minutes or until bubbly. Remove from the heat and stir until smooth. Pour the chocolate mixture through a strainer and into a pourable bowl to remove any solid pieces. Pour the pudding mixture into four 1 C ramekins or into small glasses, filling about ⅔ of the ramekin or glass. Cover and refrigerate for 2-3 hours or until firm. Meanwhile, prepare the whipped cream. Add the heavy cream, ½ tbsp granulated sugar and1/4 tsp vanilla extract to the bowl of a stand mixer. Beat with the whisk attachment until stiff peaks form. Transfer to a bowl and set aside. Once the pudding cups are firm, top with desired amount of cherry pie filling and whipped cream. Stick a Ghirardelli Valentine's Impression square into the whipped topping of each pudding cup (see photos for example). oooooo chocolate pudding!! And cherry topping. Love how easy yet decadent these are!! I’ve actually never made pudding from scratch either! My husband is OBSESSED with the stuff though, so i should probably get on that. And the cherry combo here is diiiiivine! Pinned! It’s so easy to make, Taylor! You should totally do it soon! These are so pretty Julie. I’ve never made homemade chocolate pudding either, but this looks irresistible! And I do love Ghirardelli! I can finally say that you are totally right – pudding from scratch is the best! Still like the boxed stuff but the from scratch stuff is so much better! Oh my gosh, these are just beautiful!! Julie, I love homemade chocolate pudding!! and I’m with you. . valentine’s day = sweet treats!! it’s our day to indulge right?! :) love this pudding! It’s totally our day to indulge and I cannot wait until it gets here! These are so darling! I love the bright ruby of the cherries against the chocolate! Thanks Allie! Definitely a fun treat for Valentines day! I’d never made homemade pudding before and I was always “Oh I don’t like pudding” and then I got my just desserts. It’s fabulous! I love the cherry layer, and the Ghiradelli, obvi! Pinned! I’ve always loved pudding but I seriously can’t say I’ve ever had homemade until I made these! How crazy is that? The boxed stuff will always have a place in my heart but I’ll have to make room for the homemade, too. Thanks for the pin and for stopping by too, Dorothy! Those are the cutest chocolate I’ve ever seen in my life! And homemade pudding is the best. I want some now. These look so decadent and delicious! 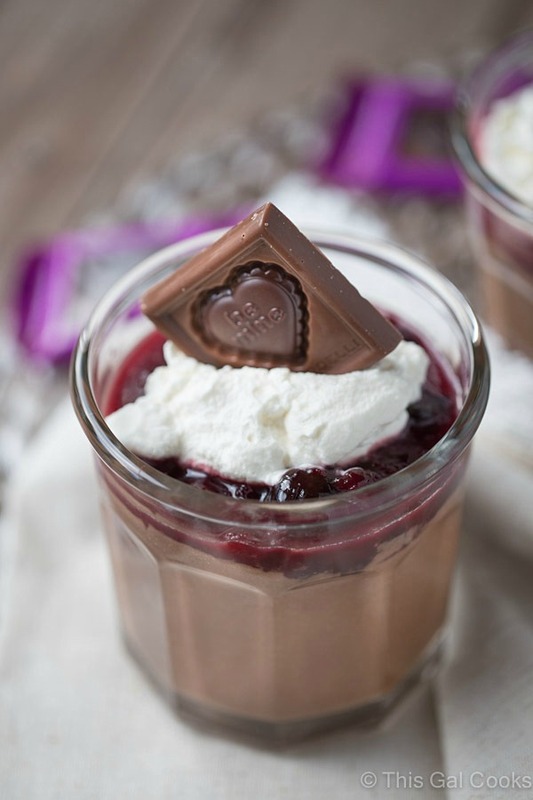 Love the chocolate and cherry combo, totally perfect for Valentine’s Day especially topped with the Ghiradhelli chocolate! Ghirardelli chocolate is the best, isn’t it?! Thanks for stopping by, Kelly! Cherry and chocolate.. fantastic combination! Actually the best! These pudding cups are adorable, Julie! I love that the pudding is homemade, makes it so much better. And your pictures are gorgeous, too. Definitely a perfect treat for Valentine’s Day! Thanks so much, Gayle! I’ll be on a quest to make homemade pudding again soon! Gah I LOVE chocolate pudding. I’ve only made it a couple times because when I make a batch, I also eat the whole batch. It is so good! And I cannot even begin to tell you how much I freakin adore cherries. This combo was meant to be! Consider my heart yours, this dessert is a keeper! Cherries are the best! But then I bought some strawberries today, made chocolate molten cakes and strawberry sauce for them. OMG. Today I think I’m more in love with the strawberries! Yum! I haven’t made homemade pudding in such a long time. But I do remember that it’s so much more rich and decadent than boxed pudding! And I’ve never used bittersweet chocolate chips before, I don’t think. Chocolate sin? I’ll have to give them a try! This pudding is absolutely gorgeous, Julie! I love love that pretty cherry pie filling on top! You just reminded me that it’s been pretty much FOREVER since I made homemade chocolate pudding. Craving this! Thank you, Sarah! Hope you get around to making homemade pudding again soon!